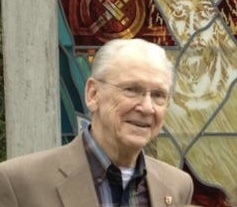 William E. Girod, 85, died Friday, January 25, 2019. Visitation will be Tuesday, January 29, 2019 at St. Columb’s Episcopal Church from 10:00 am until the 12:00 pm memorial service. William began his career as a draftsman and construction superintendent with Peyton Builders. Later he began his own construction company, Girod Builders, Inc., specializing in residential, commercial and apartment complex construction. With his extensive construction knowledge, William contracted with the FHA and VA to do residential new construction inspections. He later expanded his business interests to include sales, property management, new construction warranty programs and residential appraisals. William was a faithful communicant of St. Columb’s Church where he served as Sr. Warden, Jr. Warden and numerous terms on the Vestry. He was an inaugural member of the Stephen Ministries, served on the Board at Gray Center and Camp Bratton-Green, the state wide Episcopal Dioceses and Iona House. He also enjoyed being a member of the Men’s Club and OF and LC. William was instrumental in the formation of the Memorial Garden at St. Columb’s. He completed the program of Theological Education by Extension at the University of the South, School of Theology; was accredited by the Appraisal Review Council; certified State Board of Contractors and was a retired Real Estate Broker with the Mississippi Real Estate Commission. He also served as a West Jackson Little League Coach. He was preceded in death by: parents, Hallie Nelms and Emile Girod; his first wife, Nancy Sutherland; and sister, Patsy Spurrier. Survivors include: wife, Joanne White Girod of Madison; sons, Arty Girod (Vicki) of Flora and Win Girod (Carol) of Clinton; grandchildren, Hallie Jones (Doug), Hayes Girod (Lauren), Jon Girod (Danielle), William Girod, and Nicholas Girod; step-daughters, Kellye Whalen and Caroline McMillin; and step-son, Martin White. The Girod family would like to extend our gratitude to all the staff at Mississippi Home Care and Baptist Hospice for their attentiveness and loving care. Memorials may be made to: St. Columb’s Memorial Garden and The Little Light House of MS.